James Carpenter was born in Washington DC, USA (1948). For more than 30 years, his work has focused on the exploration of light as a means to bring form to structure and reveal the environment. Exploiting the unique opportunities afforded by the transparency, reflectivity, and structural strength of glass, the work seeks to control the intangible force of light as it affects the spatial and temporal boundaries of architectural spaces. The goal of the work is to animate these transitional spaces and engage the viewers in a rich and complex understanding of their surroundings. The projects are broad-ranging and cross-disciplinary, embracing aspects of fine art, architecture, landscape and engineering in the design of pavilions, buildings, sculptures, curtain walls, skylights and bridges. 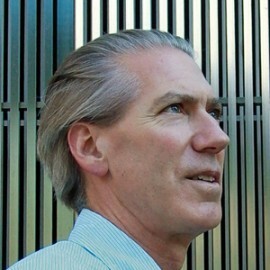 As an artist considered to be an innovator in materials technologies, James has worked collaboratively with major architects in the United States and abroad on significant building projects and has received many major architectural and public art commissions. Recently James’ work has been recognised with the Villum and Velux Foundation Award in 2010 and The Academy Awards in Architecture from the American Academy of Arts and Letters in 2008. James was given a MacArthur Fellowship in 2004 and an Honorary Royal Designer for Industry Award by the Royal Society of Arts, London in 2008. James is an Associate Member of the American Institute of Architects, and an Affiliate Member of the American Society of Civil Engineers. He is a member of the Illuminating Engineering Society of North America, and of the International Society for Glass Technology, the International Solar Energy Society and the Institute for Urban Design. He has taught and lectured all over the world including at the Lightweight Structures Institute of the University of Stuttgart, Germany, Harvard University (the Eliot Noyes Professorship), MIT, Columbia University and the Royal College of Art, London. He is married with an adult daughter, and lives in New York City.